The Brother 2340 CV Serger cover stitch is the perfect alternative for someone who’d like to give their garments a professional looking finish without having to pay the exorbitant prices that they’d have to for other high end sergers. Usually the cover stitch is only available on the really expensive serger machines but the Brother 2340CV offers this fantastic feature for less than $400, which is a really great deal! The differential feed helps eliminate wavy stitches on fabrics and produces perfect seaming irrespective of the type of fabric. The cover stitch is a serger type stitch that is used to finish cuffs, collars, necklines and hems when no fabric has been cut. The wonder of this stitch is that it is not restricted for use only at the edge of the fabric. It can also be used to create decorations anywhere on the fabric. This stitch can be made using 2 needles or 3 needles and is particularly suited for sewing knits as well as other newer blends of woven and stretchy fabrics. It works great for circular hemming and t-shirt hemming as well as for fixing lace onto any fabric and attaching binding, elastic lace or taping. In addition, it also sews a few really neat decorative stitches and can do belt loop stitching too. Many users have remarked that while they love all of the features of this machine, the one drawback is that the machine is partial to expensive thread and does not tolerate cheap thread very well. Cheaper threads tend to break more easily. This is an expense that could add up very quickly. 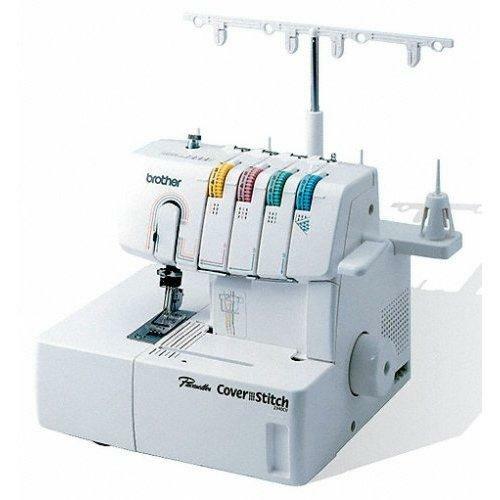 With lots of useful features at a really reasonable price, the Brother 2340CV is the perfect alternative to other more highly priced serger machines that you will find anywhere.